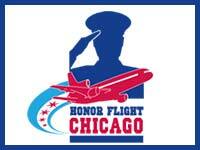 The next meeting of the Coalition of Veterans Organizations (CVO) will be on Saturday, March 16th from 10 AM to 12:30 PM at the Montford Point Marine Association, 7011 S Vincennes in Chicago. A key point on the agenda will be the April fundraiser. 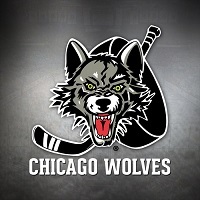 For more information: Charles ‘Smudge’ Coleman at 773-562-6992. 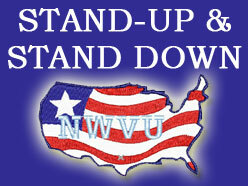 Make checks payable to ‘CVO.’ All donations to CVO are tax-deductible. CVO is a 501(c)3 organization that educates veterans and the public on veterans’ rights and needs, including Full Mandatory Funding and Eligibility for VA healthcare, the end of Veteran Homelessness and full equality of access for all veterans. 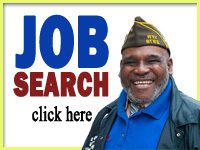 For more information about CVO, visit our website at www.CoalitionofVets.org or call 773-243-2335. We’ll be celebrating African American History Month by hearing from two Original Montford Pointers—Mr. James Reynolds and Mr. Stanley Porter—speaking on their history as original African American Marines when the services were still segregated. Be sure to come and hear their impressive stories. Both are recipients of the Congressional Gold Medal for their contributions to the Marine Corps and desegregation. We will also discuss the upcoming fundraiser in April. As always, coffee and donuts will be served! 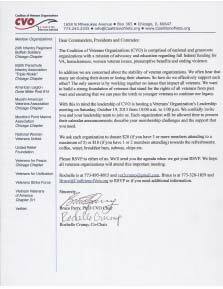 The next meeting of the Coalition of Veterans Organizations (CVO) will be this Saturday, January 19th from 10 AM to 12:30 PM at the Montford Point Marine Association at 7011 S Vincennes in Chicago. 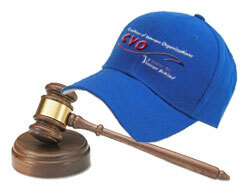 The elections to the Executive Committee (the CVO Board of Directors) is the key agenda point. All members should attend. Bruce Parry, David Rogers, Brian Stella and Sel Dunlap are up for election. After the meeting, join us for a walkthrough of House 348, the CVO-supported rehabilitated house that will be going to a veteran. The United Relief Foundation (URF), a CVO member rehabbed this house with CVO and other volunteers. It is now ready for occupation. Come see the results of our volunteer work from 1 to 3 PM after the meeting. 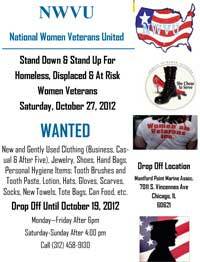 The address is 348 E 77th Street in Chicago. See you at the meeting and at the walkthrough! New and Gently Used Clothing (Business, Cas-ual & After Five), Jewelry, Shoes, Hand Bags, Personal Hygiene Items: Tooth Brushes and Tooth Paste, Lotion, Hats, Gloves, Scarves, Socks, New Towels, Tote Bags, Can Food, etc. 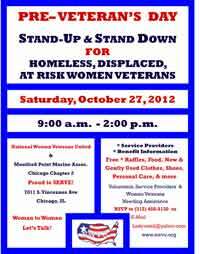 SATURDAY, September 22, AT 71ST AND VINCENNES, 10:00AM TO 12:00. 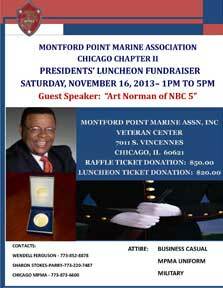 THIS IS A SMALL, DESERVING EFFORT TO RECOGNIZE AND PAY TRIBUTE TO THE MONTFORD POINT MARINES ASSOCIATION, 7011 VINCENNES. THE IMMEDIATE NEIGHBORHOOD WILL BENEFIT BY THE ELIMATION OF TRASH AND DEMEANING DEBRIS, IN ADDITION TO THE INSULT IT HAS ON OUR CHILDREN’S SPIRIT-HOOD AND SELF-RESPECT. REFRESHMENTS ONLY FOR THOSE WHO HELP!!!!!!!!!!!!. EVENT ORGANIZER—SEL DUNLAP, WAR ON FILTH AND FEAR.